End times signs seem to be escalating around the world. In so many areas - religion, politics, nature and many others - there are indications that things are almost falling apart. I have included articles in this issue on the environment - all the mostly-unexplained animal deaths in so many parts of the world are surely indications that something is seriously wrong. The increase in human diseases and problems with children is surely also among the end-times signs. There is a story about a new means of increased surveillance right in many people's living rooms. Within the military and political sphere there are also many end time signs. Within religion itself there is so much confusion. Largely, this is due to a turning away from the Word of God - the word that tells and warns us of the end time signs. My message would be for people to turn back to the Bible and read and study it - like your life depends on it. More than once a day, somewhere in the world, there is a mass die off of animals. Below (click the link) is a list of worldwide mass animal deaths for 2015, with pages also for mass die offs from the previous 4 years. There are animals dying all over the world today in huge numbers, due to the polluted state of the sea and air. 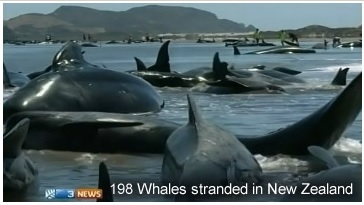 Millions of Fish and massive numbers of whales and dolphins are washing ashore dead. Birds are falling dead out of the sky, and millions of poultry are dying from avian flu. The animals of the land like cattle are also dying in large numbers from disease. Although animals and fish have been dying all throughout history, we have not seen the massive consistent numbers that we are seeing today. I believe that we have the power to stop the autism epidemic in its tracks. In order to do this, we must increase the number of people who understand the root causes of the epidemic. We must increase the number of people who understand that we are all touched by this epidemic. So how do we increase the number of parents and citizens in this country who understand what is happening to our children? How do we accelerate their learning? I present to you, Canary Kids: A Film For Our Children. This is a documentary film that is being funded by us, the parents, the scientists, the writers, the advocates, the people who "get it," who want everyone else to "get it" too. But we need your help. There is no precedent in contemporary weather records for the kinds of droughts the country's West will face, if greenhouse gas emissions stay on course, a NASA study said. No precedent even in the past 1,000 years. The feared droughts would cover most of the western half of the United States -- the Central Plains and the Southwest. Those regions have suffered severe drought in recent years. But it doesn't compare in the slightest to the 'megadroughts' likely to hit them before the century is over due to global warming. These will be epochal, worthy of a chapter in Earth's natural history. Even if emissions drop moderately, droughts in those regions will get much worse than they are now, NASA said. The space agency's study conjures visions of the sun scorching cracked earth that is baked dry of moisture for feet below the surface, across vast landscapes, for decades. Great lake reservoirs could dwindle to ponds, leaving cities to ration water to residents who haven't fled east. "Our projections for what we are seeing is that, with climate change, many of these types of droughts will likely last for 20, 30, even 40 years," said NASA climate scientist Ben Cook. Cancer rates have exploded at an increase of almost 6000% in areas near the reactor meltdown. Aside from people-on-the-street interviews that a rare media outlet like "Hodo station" will report on, mainstream media stays completely silent. One Japanese resident, Carol Hisasue, laments that as the incident has disappeared from the media, it has also disappeared from people's consciousness. So why does Fukushima continue to be a see no evil, hear no evil event? You can watch an over hour-long report that goes into detail, but to sum it up, people can't even turn on their gas-stoves near Fukushima because "it would be like burning radioactive fuel in their kitchens." The contamination levels are too ridiculous to even comprehend. The policy has drawn the ire of internet users, who compared it with George Orwell's dystopian fiction 1984. While voice recognition software almost always transmits data on what users are saying - so that the job of decoding it can be done by quicker computers elsewhere - the combination of sending the data to third-parties and the comparison with Orwell has meant that the Samsung policy has drawn particular attention. The policy states: "Please be aware that if your spoken words include personal or other sensitive information, that information will be among the data captured and transmitted to a third party through your use of Voice Recognition." 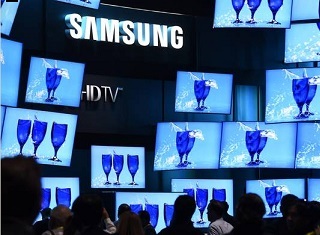 It makes clear that the tool can be turned off through settings, though that will stop the voice recognition working entirely and Samsung will still continue to collect data about how people use the TV. "While Samsung will not collect your spoken word, Samsung may still collect associated texts and other usage data so that we can evaluate the performance of the feature and improve it," the policy states. Every day now, there are fresh news stories about Christians being slaughtered by ISIS in the Middle East. So where is the outrage from the White House? Where is the outrage from the Islamic world? If Islam truly was a "religion of peace", prominent Islamic leaders all over the globe would be loudly condemning ISIS whenever another slaughter of Christians took place. And a White House statement about the beheading of 21 Egyptian Coptic Christians by ISIS the other day did not have the word "Christian" in it a single time. 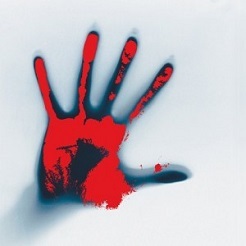 ISIS is painting the Middle East red with the blood of Christians, and most of the world seems to care very, very little. If thousands of people from some politically-favored group or religion were being savagely killed, the outcry would be deafening. But because Christians are being killed, it is not such a big deal. So exactly what does that say about how the world views Christians in 2015? Ray's note: With all the groups fighting each other in the Middle East, the U.S. never knows if the people it is arming today will be friends or foes tomorrow. I once heard someone remark that alliances in the Middle East shift like the sands of the desert. The problem is that the west has been supplying many of these countries or groups with weapons for decades. And that is still going on today. Click here to watch a short video where an ISIS leader claimed "We Are Being Funded By the United States." the Great Patriotic War at the Kremlin, Feb. 20, 2015. 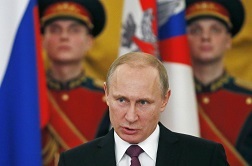 Russian President Vladimir Putin said on Thursday other countries should not think they can attain military superiority over Russia, Interfax reported. 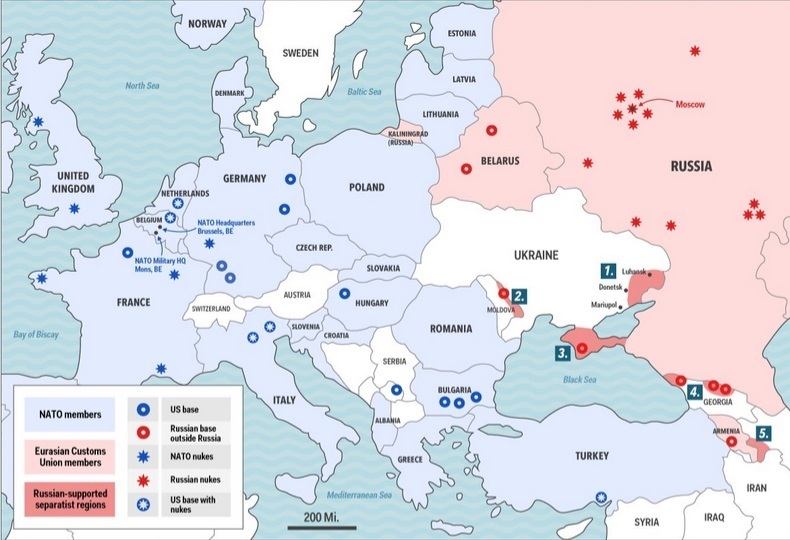 "No one should have the illusion that they can gain military superiority over Russia, put any kind of pressure on it. We will always have an adequate answer for any such adventures," he was quoted as saying in an address dedicated to the Defenders' of the Fatherland Day holiday next week. "Our soldiers and officers have proven that they are ready to act decisively smoothly, professionally and courageously, to perform the most difficult non-standard tasks, as befits a modern hardened combat-ready army that protects their traditions and military duty," according to a Business Insider translation of BBC's report. The bellicose statement comes as Russian-backed rebels are gaining territory in eastern Ukraine. It doesn't take too much to imagine a big (pink, in the case of this map) bear facing the west with 3 ribs in its mouth - three territories being consumed and added to itself. What does much "devour flesh mean? What else could be coming?" Nuclear Specter Returns: "Threat of War Is Higher Than In The Cold War"
FEMA Activates the Clergy Response Teams?! 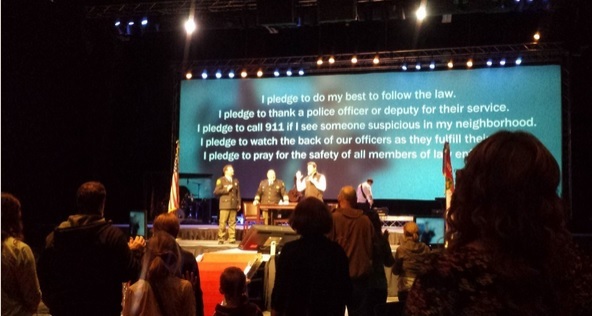 Church Pushes Congregates to Submit to Government and ... You Won't Believe What Else! Has it Begun? By now many of you are aware of the infamous group formed by FEMA and DHS who recruited 28,000 pastors to be part of the Clergy Response Team-a team of pastors whose duty it will be in the event of any beck and call from the Government to round up citizens-be it for catastrophe, an outbreak, or whatever them deem necessary. These pastors have sold not only their congregations out but also left God at the doorstep doing so. Shadrack, Meshack and Abednego were tossed into a fiery furnace because they would not bow to an Idol. However, they were the only ones who stood in opposition to what the king demanded of his people. Everyone else caved under pressured and bowed out of fear of being thrown into the furnace. Sadly, this is exactly what we see happening today. Many churches are 'caving under the pressure' of the government and allowing them to limit what they can and can't say. There are those who believe that life was first brought to Earth from far across the universe. In fact, this week there were headlines in news sources all over the world about how British scientists had discovered "evidence" that extraterrestrials may have seeded life on this planet. And as you will see later on in this article, some of the "most brilliant minds in science" have been promoting this theory for a long time. But now the support for an extraterrestrial origin for life on Earth seems to be reaching a crescendo. In addition to unprecedented scientific support, we are being constantly bombarded by messages in popular culture that our planet has been in contact with aliens in the past and that they are about to make contact again. This is a theme which we see in dozens of novels, television shows, movies and video games. 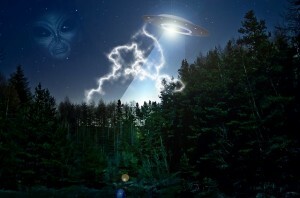 So could it be possible that we are being "prepared" to believe that extraterrestrials seeded life on our planet? And as you will see below, there are even many that actually believe that Jesus was an alien. Yes, that probably sounds very strange, but there are some very important people that are actually convinced that this is true. Hundreds of "Churches" to Celebrate "Evolution Sunday" as Others Celebrate "Creation Sunday"
Nearly 500 "churches" in the United States will commemorate Charles Darwin's birthday this week with "Evolution Sunday," but many other congregations plan to recognize the biblical Creator and celebrate "Creation Sunday" instead. 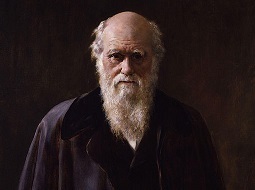 February 12, Darwin's birthday, is commemorated each year by atheists as International Darwin Day. However, many "churches" also plan to celebrate the birth of the notorious naturalist by following the advice of atheist Dr. Michael Zimmerman and hosting "Evolution Sunday" or "Evolution Weekend" events. "Evolution Weekend is an opportunity for serious discussion and reflection on the relationship between religion and science," Zimmerman's website says. "An ongoing goal has been to elevate the quality of the discussion on this critical topic, and to show that religion and science are not adversaries." Since 2006, thousands of congregations that believe the Bible and evolution are compatible have observed Evolution Sunday and similar events. So far, nearly 500 congregations have pledged to recognize the event this year, with California, Pennsylvania, New York, and Ohio being the states with the most participating "churches." To counter the Evolution Sunday apostasy, many churches are planning to instead observe "Creation Sunday" as an affirmation of their beliefs in biblical creation. Tony Breeden, founder and organizer of Creation Sunday, told Christian News Network that biblical creation beliefs are important, because "evolution undermines the authority of God's Word and the foundational basis of the gospel." Ray's note: While the question of whether this earth and life on it came about by creation or evolution is an important one, the debate misses another important, but very-much-related point. Both sides in the debate commemorate on a Sunday - the first day of the week. The Bible itself says that the seventh or last day of the week (what we call Saturday) was the day on which God rested from creating and the day on which He specified we should remember His creative work. If people had remembered the Sabbath and the reason for it there wouldn't be a creation-evolution debate. Students in Aberystwyth (U.K.) are pushing for thousands of Gideon Bibles to be removed from university accommodation. A poll conducted by the students' union claims that more than half of students felt that having the Bibles in university accommodation as a matter of course was "uncomfortable" or "unacceptable." The call to ban Bibles mirrors action by the University of Huddersfield in 2013 - it said it wanted its properties to be "ethically neutral." Student John David Morgan raised the matter at a student council meeting that 50 people attended in January. He claimed that the "inclusion of Bibles in university bedrooms is inappropriate in a multicultural university such as Aberystwyth." The student went on to say: "It could be offensive for some, and the university should provide a safe space for students to explore and develop their beliefs in a neutral environment." A spokesman for The Christian Institute said: "It is hard to imagine how a person could actually be offended by a Bible simply being in their room. "The Gideons have been supplying Bibles free of charge for over a century now, providing support and encouragement for Christians and non-Christians alike. 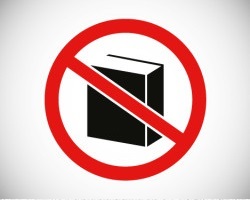 "Banning the Bible because some people might be uncomfortable with it would be a huge overreaction. Washington (CNN)House Speaker John Boehner announced Thursday that Pope Francis has accepted his invitation to address a joint meeting of Congress, and will appear on Sept. 24. The visit will mark the first time the head of the Catholic church addressed a joint meeting of Congress. Boehner, who frequently references his own Catholic faith, said "we're humbled that the Holy Father has accepted our invitation and certainly look forward to receiving his message on behalf of the American people." The Speaker issued an open invitation to the pope last March, on the one year anniversary of Francis becoming the leader of the Catholic church. The Pope's trip to the United States later this year had been confirmed but the exact details were not known. He's expected to attend a World Meeting of Families summit in Philadelphia, which is occurring during Sept. 22-27. 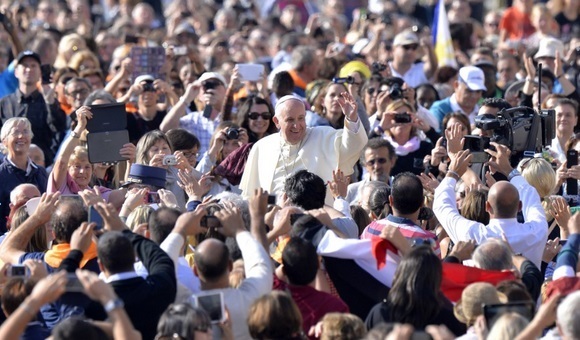 In November 2014, the pope said he would also visit New York during his September 2015 visit. Pennsylvania Republican Rep. Patrick Meehan noted he was looking forward to the visit to his home state, but said with so many people expected to come out in Philadelphia, "the access will be limited." "The chance to be on the floor when he addresses the joint session I think will one of the highlights for me," Meehan said. House Democratic Leader Nancy Pelosi, who is also Catholic, said in a written statement she was "overjoyed" the pope agreed to come this fall. "Pope Francis has renewed the faith of Catholics worldwide and inspired a new generation of people, regardless of their religious affiliation, to be instruments of peace," Pelosi said. Ray's note: stay tuned - there is much more to come in months ahead. There are end times signs all around us and many interesting events coming. Some are interesting because of their timing. On this coming September 24 (2015), there will be an address by Pope Francis to the U.S. Congress, the first ever. 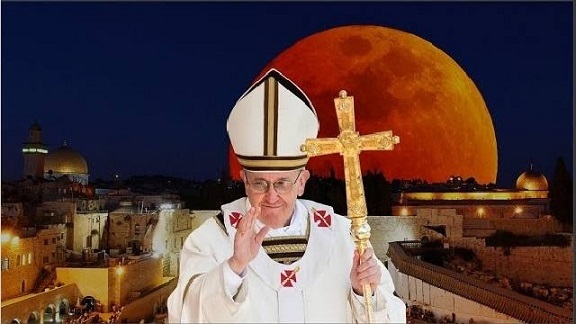 Within a week of that there is also the most solemn Biblical feast of the year, the Day of Atonement as well as the fourth of the tetrad of blood moons occurring on four successive Biblical Passover/Tabernacles feasts. I believe we will see some very interesting developments this year - but, of course, just my thinking that is not evidence to go by.